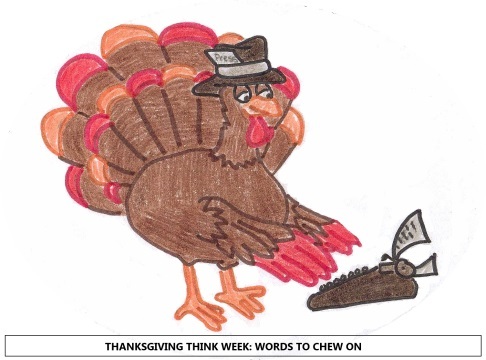 THANKSGIVING THINK WEEK: This is the first in a series of stand-alone essays to be published this week that will offer hard-hitting, thought-provoking words to chew on during this holiday season. Nearly 300 years have passed since essayist Jonathan Swift famously penned his “modest proposal” that the Irish eat their own children. What follows is a much-needed update to one of the most influential satires of all time. Recently, Congress debated whether to raise the federal debt limit. In serial press conferences with all of the melodrama of soap operas (but none of the depth), politicians have held forth on whether $16.7 trillion dollars in debt was quite enough, or perhaps only a good start. On the one hand, Democrats asserted that, until every citizen (and non-citizen!) in the United States had a personal chef, a corporate jet, a Slip-‘n-Slide, a pony, a Trans Am, an Easy Bake Oven, and a canoe, there would be no fairness in America. Unless he bathes in alpaca cream and Lafite Rothschild 1982, just like Mitt Romney’s dog in his offshore kennel in the Cayman Islands, Democrats said, the Common Man is forever oppressed, and will never know Sweet Justice. As it turned out, immediately after the debt ceiling was raised, the federal government promptly borrowed three hundred billion dollars, putting the federal debt above seventeen trillion dollars, and mooting all speculation as to whether we will ever repay what we owe. Shortly thereafter, China began seriously pushing for an alternative currency for international transactions. And the Saudi government signaled strongly that its alliance with the United States is effectively over. Once petroleum is no longer denominated in U.S. dollars, our Keynesian joyride is done, and we will all have to get out of the car, lie face down on the concrete, and be mirandized in either Arabic or Chinese. Unless, that is, we realize that, with just a few slight adjustments in public policy, the debt problem, and all of the consequences of bacchanalian inflationary spending, will simply disappear. What I offer here is a modest proposal, and one that is sure to unite both parties in a grand bargain that will end the debt limit as a political issue. 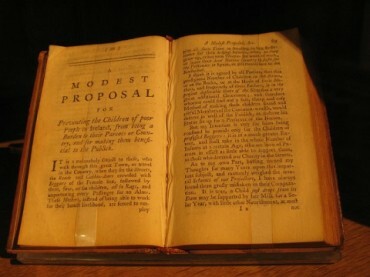 If the Republicans object to the debt on the grounds that it is immoral to saddle children with our unmet obligations, and if the Democrats, following their 2012 platform, object that it is immoral to have children in the first place, I see the makings of a compromise that will put the wildly successful one of 1850 to shame. America, the time has come to stop having children. They will only have to pay off our debt, and it would be unfair–heartless, cruel, even–to bring a child into such a world. For their own sake, the children of tomorrow must be killed. The technology to bring this about is already in place, and has been for decades. If you have an unsightly blob of tissue growing inside of you, for example, that might one day grow into a “person” with a concomitant share of the national debt, you may travel to any Planned Parenthood or abortion mill you wish in order to have that “person’s” skull punctured, brains vacuumed out, and limbs dismembered and removed. You will have the satisfaction of knowing you have acted mercifully, sparing your “child” from the crushing burden of paying off the national debt they would otherwise have inherited. What’s more, this method for eliminating the most helpless would-be victims of the debt is perfectly legal, just like the rise of the National Socialist Party in Germany during the Weimar Republic. In 1973, the Supreme Court, in one of its most enlightened decisions since Dred Scott in 1857, declared that precisely the same “people” that would have been heaped upon with the burden of our debt were not, actually, people at all. Thankfully, unborn children have no rights that the grown man is bound to respect. With our consciences thus eased by the legality of our actions, we can flock to Planned Parenthoods throughout the land with light feet and happy hearts, doling out mercy and love to the unfortunate millions who, without the Supreme Court, might have had to pay a mountain of taxes to support us. The law is always just, and justice is always coterminous with the United States Supreme Court. But what will happen, you might ask, if we have no more children? Won’t we all just disappear? Nonsense! Ray Kurzweil, founder of Singularity University and consumer of 150 vitamin supplements per day, confidently assures us that, soon, robots will swim through our blood, zapping viruses and bacteria and keeping us free of disease. Eventually, we will all be able to upload our consciousnesses into deathless computers, ensuring a happy existence for the rest of eternity. What could possibly go wrong? Since supplies of supplements, robots, and computers are limited, though, it wouldn’t be right to deny anyone the ability to live forever as a program running in a machine. Thus, the only moral option is to prevent children from being born. All they would do is die, anyway. And is that any kind of life? Since we are the last generation that will have to think about death–a topic that has caused no end of anxiety since all that business in the garden, when, as usual, our peerless advice was not taken into consideration–would it be fair to ask anyone else to face God alone? Let’s put Judgment Day in the permanent cryogenic deep-freeze. We’re past all of that now. God’s had His say, but now we get to call the shots. And we believe that no one should have to die anymore. Which is why we will have to kill all of the children. Living forever would also erase the problem of the national debt in one fell swoop. Without limits on our lives, there would be no need to obey any laws of fiscal consequence. With an eternity to repay each debt, debts would become meaningless. Loan me eleventy bajillion dollars, you miser–you’ll get your money back eventually! What we find, then, is that there are no drawbacks to this plan. It is safe, legal, and entirely possible. All that is standing between us and blissful immortality is a vestigal clinging to the outmoded morality of the old Hebraic religions. But who needs Torah when we have potassium in 1000 mg doses? Who needs Moses when we have Ray Kurzweil? And who, after all, needs Psalm 139 when we have the scintillating pronouncements of the Department of Health and Human Services, whose resplendent wisdom is poised to usher humanity beyond its biological shackles and into the endless golden age of debt-free, guilt-free, child-free, consequence-free mechanized existence? Lo, I see Kathleen Sebelius now, coming over the mountain, hastening to tell us that the sun is rising on the first deathless day for mankind. In short, this proposal is as modest as it is overdue. So that our children might not inherit our debt, we must kill them all. And so that our debt might not swallow us whole, we must escape from our humanity–transcend our flesh, if you will, and let our creditors look for us among the hollowed-out husks of our former bodies. Evasion is responsibility. Murder is mercy. Death is eternal life.